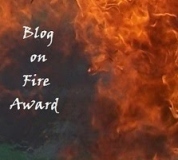 It’s quite catchy: Blog on Fire Award! So CP shared 8 unusual things about herself and I will just say that out of her 8, I shared a bit of commonality with her. I don’t have cable and I hardly have time to watch t.v. but G has cable and I guess if I really want to, I can watch tv with him. So with that, I want to take this time to thank these following blogs for their blog friendships and because they are muy caliente!!!! Lastly but certainly not the least, catpurrology’s site because their blog is on FIRE! ← When you are lost, create your own map to get through! Thanks so much for the award! I will indeed pass it along when I get the chance. Thanks very much for thinking off me! Now about my nomination…… You have given Zoey the Cool Cat a big head. I had just gotten her out of control and now she’s running around thinking she’s going to get a mourning dove………. I’m sorry, I meant Sally’s Catpurrology. Crazy (but hot hot hot) Saturday. Thank you for mentioning Colltales yet again, Lisa. CONGRATULATIONS on your award. Thanks for visiting my blog.